Essay's extensive CD catalogue is masterminded by the energetic Richard Kapp who sprang to fame in the seventies with various recordings for the Vox Label. I still cherish an LP of the Rubinstein Second Symphony that is unmatched for sheer visceral excitement and power. 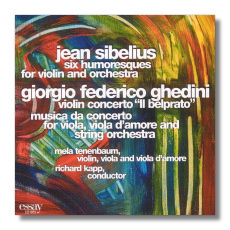 This delightful disc couples the famous Sibelius Humoresques with two unknown pieces by Ghedini, a modern composer whose music is quite underrated. The Humoresques are quite genially played by Tenenbaum who brings clarity and precision to the fast allegro pieces and seminal thoughtfulness to the slower movements. This able soloist takes on Ghedini's forbidding 'Il Belprato' Concerto with aplomb and brings an assured air of confidence throughout especially in the difficult cadenza like parts. She is no less involving in Musica da Concerto for viola in which the often downright hostile solo parts are more or less despatched with consummate virtuosity. Richard Kapp's accompaniment is understanding and brilliant in places, especially in the Ghedini which is pretty complex music. A Major discovery then and an intriguing disc for those in love with the violin and viola.